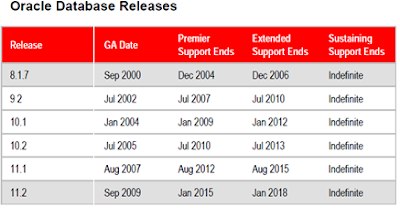 Oracle 10g R2 is going out of Extended Support by Jul 2013. It’s time to upgrade your database to 11g. Premier support usually ends 5 years after the release of a version. After ending the premier support, we can buy Extended support which covers next 3 years and we have to pay extra fee. Please find the Extended Support fee. For more info please see the detailed benefits and key features comparison.